It can be difficult for someone in the serving profession. Customers can be rude, the cooks and other wait staff can be inpatient, and sometimes the money just feels like everything isn't worth it. But it's time to look differently at the serving job. Servers provide people with fuel...they fuel us after we've had a bad day and just need a place to crash. They fuel us with stories and laughs and friendly service. But most importantly, they fuel us with fuel...food and drink! This 100% cotton costume dress stretches to fit, and laces up the front with a zipper in the back. The brown corset and green skirt with lace petticoat are both velour-style. The white apron ties around the waist and has a floral pattern around the edges. 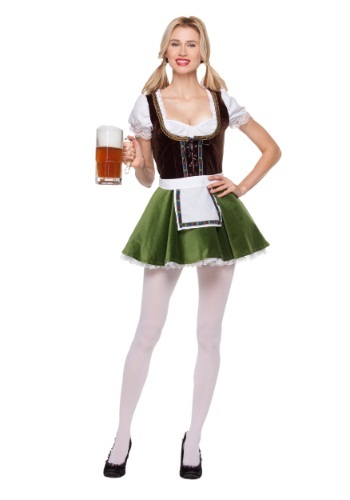 Just be sure to add a pair of our black high heels to complete this outstanding costume!